Jenni had been in an abusive relationship with Ed for far too long. He controlled Jenni's life, distorted her self-image, and tried to physically harm her throughout their long affair. Then, in therapy, Jenni learned to treat her eating disorder as a relationship, not a condition. By thinking of her eating disorder as a unique personality separate from her own, Jenni was able to break up with Ed once and for all. Inspiring, compassionate, and filled with practical exercises to help you break up with your own personal E.D., Life Without Ed provides hope to the millions of people plagued by eating disorders. Beginning with Jenni's "divorce" from Ed, this supportive, lifesaving book combines a patient's insights and experiences with a therapist's prescriptions for success to help you live a healthier, happier life without Ed.
" 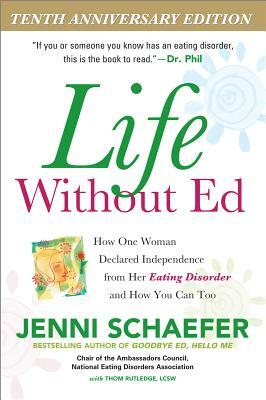 Life Without Ed] was the first book] to teach readers that they can not only separate from their eating disorder, but also disagree with and disobey it. I wholeheartedly recommend this witty, hopeful guide to patients, carers, professionals, and anyone else who wants to understand what it's really like to live with an eating disorder and ultimately triumph over it." "This uplifting book's intimate inner dialogue has energized countless young women--and men--in their own recoveries from eating disorders." Jenni Schaefer is an internationally known writer and speaker whose work has helped change the face of recovery from eating disorders. Appearing regularly on national radio and television, she is the bestselling author of Goodbye Ed, Hello Me. Recently she has collaborated with Harvard Medical School to coauthor Almost Anorexic. She is also the chair of the Ambassadors Council of the National Eating Disorders Association. An accomplished singer/songwriter, Jenni lives in Austin, Texas. For more information, visit www.jennischaefer.com. Thom Rutledge is a psychotherapist and the author of Embracing Fear: How to Turn What Scares Us into Our Greatest Gift. For more information, visit thomrutledge.com.